Shortly before midnight on April 14, 1912, on the fourth day of its maiden voyage from Southampton to New York, the greatest ocean liner in the world, though built to be unsinkable, hit an iceberg and within two hours and forty minutes, broke apart and sank two and half miles to the ocean floor. The sinking of the RMS Titanic was one of the worst peacetime maritime disasters in history, and of the 2,223 people aboard, only 703 survived. But given the amount of time between the collision with the iceberg and the ship’s total immersion under water, all could have been saved – had there been enough lifeboats, and had those lifeboats been filled to capacity. As it was, women, children, and the very rich, fared, that night, the dismal best. Forty per cent of 1st Class was lost; sixty per cent of 2nd; seventy-five of 3rd, and a like percentage of the crew. Hope you all well. This is the boat she is a peach. She smashed into another boat leaving Southampton. There is a great vibration here in the stern. Shall be in Queenstown today. Get N.Y. next Tuesday so will write again later. Sea quite calm. Fondest love to all & X for Puss. Charlie Shorney went down with the ship; his body was never recovered. Autograph Letter Signed (“Charlie”), being a 1 page postcard, 3 ½ by 5 ½ inches, postmarked Queenstown, April 11, 1912. To Mr. A. Shorney in Sussex. 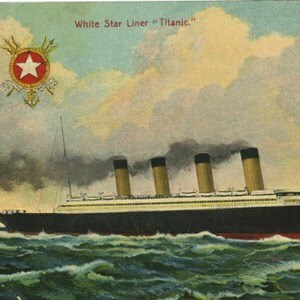 Postcard image on verso depicts, in color, the RMS Titanic at sea, with the White Star Line insignia at upper right corner; published by “Motional Series, Great Britain, #1756.